Did Apple Lose an iPhone 5 Prototype? Apple iPhone Security Manager: One of our prototypes, an iPhone 5, was last reported in the area of the Mission District. We have not heard from her for some time. Steve Jobs: Underling, you’ve lost another iPhone? 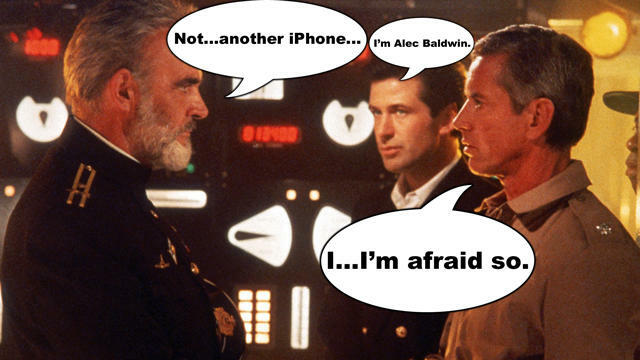 If that sounded vaguely familiar, it’s because I took it from The Hunt for Red October – which explains the images- and yes, having Steve Jobs in there made sense as this happened last month. According to CNET, Apple Security and San Francisco police have been trying since last month to track down an iPhone 5 that went missing from a Mission District bar named Cava 22 late last month. It apparently then ended up Craigslist and was sold for a mere $200. Apple tracked the device to a two-story home in the Bernal Heights neighborhood of the city, and after a search of the residence by police that turned up nothing, the unnamed source says Apple employees on the scene offered the man cash and a no questions asked agreement if he would return it. He maintained that he had been at the bar on the night in question, but he had no knowledge of the device. Apple and Craigslist have so far had no comment, while the police department is saying that no report has been filed on the incident. Should this story prove to be true, it’s hard to fathom how to even begin speaking about it. Could Apple really have lost two prototypes in a row? After the debacle with the iPhone 4, you would have thought the iPhone 5 prototypes would be surgically grafted to the people using them. Sure there were the supposed photos of one being used on a train, but that’s still quite a bit different than one going missing in yet another bar. Last time it was a German beer garden, this year a “tequila lounge,” my bet is next year an iPhone 6 will go missing from a tiki lounge. Considering the coverage this is now receiving it is doubtful the iPhone 5 prototype will show up on any sites, if it’s even really out there. If it is, you know someone is currently sweating bullets waiting for the S.W.A.T. team to bust down their door. What do you think? Did Apple lose an iPhone 5 prototype?